Hale, a hiker, birder and naturalist, stops to take a photo on a mountain summit during a recent trip. 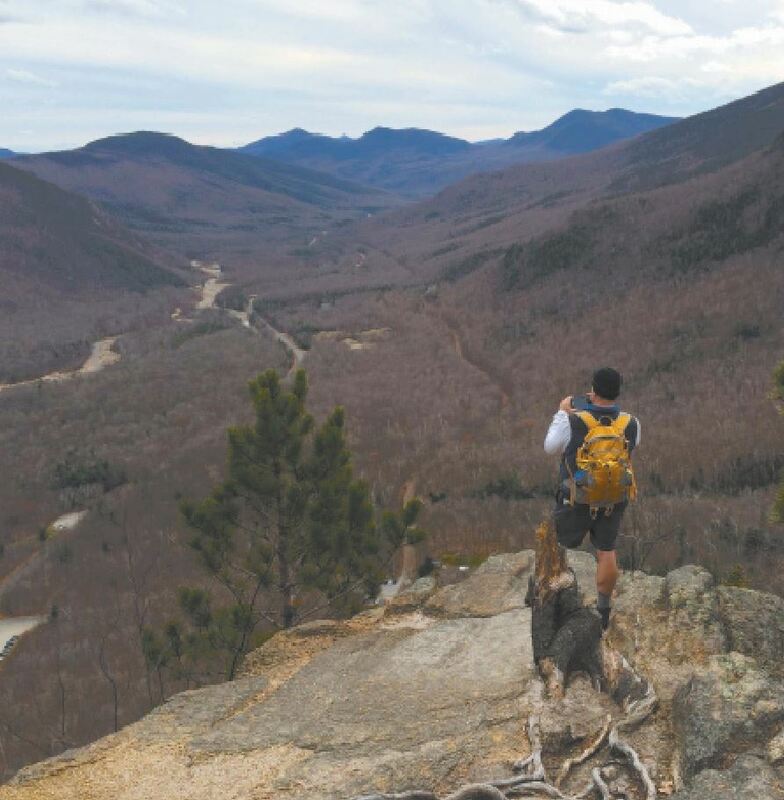 AMHERST – When Steve Hale came up from Louisiana to New Hampshire for graduate school in the early 1990s he had little interest in hiking. What did interest him was birds, and he did his Ph.D. thesis on the Bicknell’s thrush, a small bird that can be found in the high mountains of New Hampshire in the summer. That meant hiking at high altitudes, and it was rough. He gave up smoking, but in those early years he wasn’t a passionate hiker. Time went by, kids entered the picture, and it wasn’t until 2010, prompted by his love for birds and wildlife, he started to hike again and found a way to put that hiking into a structure without becoming a 4,000-footer. A 4,000-footer is a hiker who climbs mountains that are 4,000 feet or more, but that didn’t appeal to him. Then he discovered a red-line hiking website. Red-line hiking means hiking all the trails in a particular area, denoted often with red lines. For Hale that meant hiking all the red-lined trails in the Appalachian Mountain Club’s White Mountain Guide. “Like coin or stamp collecting, we collect trails,” he told his audience at the Amherst Town Library during his July 19 presentation. It’s a rare hobby. There are more than 12,000 people who have climbed the 48 peaks of the White Mountains that are more than 4,000 feet high. Last year there were only 35 red-line hikers recorded on the White Mountain Red-Lining website. But there are plenty of trails, more than 1,440 miles of red-line trails in the White Mountains, and gorgeous scenery. So far Hale has covered 74.7 miles, which means over the years he has “collected” 54 percent of the trails. The new hobby meant extending his idea of when to hike. Having come from Florida and Lousiana, Hale had no love of winter, but eventually he discovered the beauty of the White Mountains when there’s snow on the ground. His slide show included gorgeous mountain views, as well as work sheets with data on miles he’s hiked and the percentage each segment accounts for. “It’s a lifetime goal. No one can do it in a year,” he said, and was promptly contradicted by a man in the audience who said a hiker was in the news recently for having done just that. “For most of us mortals, we hike in segments,” Hale said. Hale something brings his children, ages 7 and 14, but usually hikes alone. “It’s hard to find crazy friends who want to hike 1,440 miles,” he said. Hale’s talk was part of the Amherst library’s Build a Better World summer series for adults. He holds university degrees in marine biology, evolutionary biology, and ecology. An avid hiker, birder, and experienced naturalist, he formed Open World Explorers last year and gives guided tours of New England landscapes.